ISLAMABAD: Over 80 Terrorist were killed as Pakistan Air Force (PAF) jets bombed hideouts of Terrorists in Dattakhel area of North Waziristan early on Sunday, ISPR reported. However local security officials put the death toll far higher, saying that about 150 Terrorist died in the air strikes. The air force also carried out shelling late Sunday morning in the Mirali area of North Waziristan. An Inter Services Public Relations (ISPR) press release confirmed that terrorists linked to planning the attack on Karachi airport were present in the hideouts that were bombed. The mastermind behind the attack – Abu Abdur Rehman Almani – was among the dead,Media reported. At least 37 people, including 10 terrorists, were killed in the all-night battle at Jinnah International Airport that had started on June 8. The Islamic Movement of Uzbekistan (IMU) had claimed responsibility for the attack. It was also a new Trend observed in the Attack at the Karachi International Airport , that Two Terrorist Organisation , claimed the responsibility of the attack , Firstly Tehrik e Taliban Pakistan , through their Spokeman , Shahid ulllah Shahid , Claimed the Reponsibililty of the attack , and even the FIR Registered by the Government , was against the TTP , and Shahid ullah Shahid was nominated in it, But surprisingly after about 48 Hours , The Islamic Movement of Uzbekistan , claimed the responsibility of the Airport Attack , and also released the Pictures of the Terrorist , who took part in the attack on its Website. It should also be noted that the Islamic Movement of Uzbekistan , has also been linked to the Islamic State of Iraq and Syria , ISIS , which is also involved in the terrorist attacks across Syria & Iraq , and after its crushing Defeat by the Syrian Forces , now it has intensified its terrorist activities in Iraq , and this is the same terrorist Organisation ,which has attacked the City of Mosul , in the Province of Nineveh , near Samara the Last resting Place of the Two Shia Imams , while ISIS is the relatively a new Terrorist Organisation , and is Off Shoot of Al Qaeda , which is totally sponsored by Saudi Monarchy . And it is created Havoc in Middle East and Africa , and now Paksitan which is already been under attack by the Saudi Sponsored Taliban , and its allied Organisations , now as under threat of elimination from Middle East , as in the latest Scenario of Syria , where the Syrian forces are aggressively taking back control of their earlier captured regions by these Rogue Elements , have increased their terrorist activities , in Iraq and Pakistan , to Prove their existence . The ISPR stated that mostly Uzbek foreigners were killed in the strikes. An ammunition dump was also destroyed, according to the press release. Terrorists of East Turkestan Islamic Movement (ETIM) were also allegedly killed in the bombings, Media reported. “Up to 150 people were killed during the strikes early Sunday. These strikes were carried out based on confirmed reports about the presence of Uzbek and other militants in the area,” an intelligence official said. Another security official said that “the number of the killed people was even more than 150″. The Pakistan military has not confirmed the higher figure. Following the incident, the local political administration imposed a curfew in the area for an indefinite period. 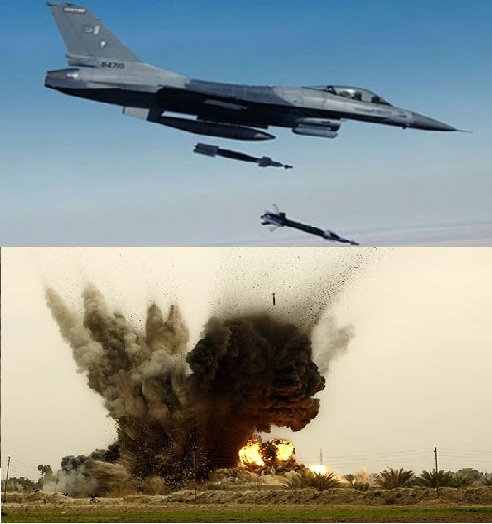 On Jun 10, aerial bombing in Tirah valley of Khyber Agency killed at least 25 militants. On May 23, gunship helicopter and jet planes bombed hideouts of suspected militants in North Waziristan, killing four and injuring three others. This entry was posted in Jafria, Pakistan News and tagged ISIS, Islamic Movement of Uzbekistan, Islamic State of Uzbekistan, North Waziristan, Pakistan Air Force, Pakistan Airforce, Pakistani Jets, terrorist organisation. Bookmark the permalink.